Our first employee spotlight is going to go to our head surgery technician, Brandi Miller! We are very fortunate to have her as part of our staff. You can rest assured that with her as the head of our surgery staff, each patient is receiving the best possible care. She is not only an informative, thorough and caring nurse but is also known at the office for her lively personality and incredible sense of humor! Hello fellow animal lovers! My name is Brandi. 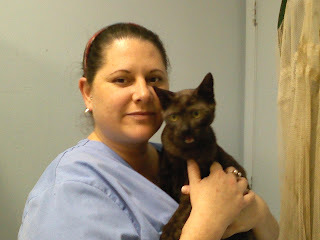 I have made animal medicine my career instinctively for 18 years. I have proudly served as senior surgical nurse at DPC for the previous 11 years and counting. I am an avid animal lover and advocate, therefore choosing DPC as my home was only natural. Our hospital and its employees have never compromised our integrity for the sake of just “business”. We have always been a step above the rest and maintained our goals as such throughout the years. My purpose has been and always will be the comfort, safety and health of your pet first and foremost. That is my pledge to all of my animal friends. Hope to see you soon!